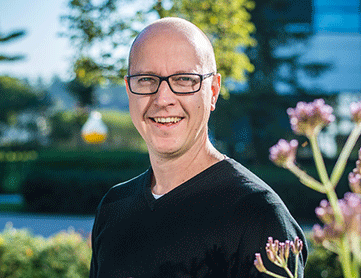 Tom Aelbrecht, Head of Campus Office, has been working for Janssen for eighteen years now. As a computer scientist, he is a bit of the odd man out within the company. However, his background enables him to bring in a different view. His daily work involves accelerating innovation and implementing technologies. His ultimate goal: improving healthcare. Tom is head of the Janssen Campus Office and is involved in the growth strategy of the Janssen campus in Belgium. His goal is to make an innovation powerhouse of the campus, where different capabilities meet. In cooperation with start-ups, companies and universities, Tom wants to create a R&D ecosystem. He also wants to innovate in the areas of supply chain, talent development and sustainability. [email protected] is an example of such an innovative cooperation. The goal of this platform is to stimulate the research environment for start-ups. Johnson & Johnson, the parent company of Janssen, has started this initiative to develop a physical ecosystem for researchers on campus in Beerse. It is a well-established interplay where each other’s expertise can be used. "We don’t need all the expertise in-house, but we do need it in our network. Together we can handle the challenges of healthcare in the future." One of the biggest challenges of the future is the affordability of healthcare, according to Tom. Data and technology could play a large role. Tom emphasizes the necessity of a holistic approach. “When we link e-health data with biological data of healthy people and patients, we can clearly map the development of the disease. This information can be used to show which interventions actually have an effect. Together with partners Janssen is investing in this field”. "Pioneering in the area of medical innovation, that part of Janssen’s DNA." Tom works for Janssen for a long time, because he always had the opportunity to develop himself. Tom says that Janssen does not only feel responsible for their employees, but also the world we live in. Within the Global Public Health programme, they invest for instance invest in providing tuberculosis treatment in developing countries. Moreover, also locally Janssen takes its responsibility. Colleagues can volunteer for a day, helping for example in an elderly home. "Janssen has one clear vision: create value for patients, employees and the surroundings." Applying for a job at Janssen was an easy choice for Tom. In his close environment, he was confronted with HIV and cancer. This had a huge impact on him, as he encountered the vulnerability of health and the importance of medicines. Being able to contribute to this, motivates him every day. Tom himself tries to live healthy by moving enough and eating nutritious meals, even though this remains a challenge. "Health is not always a choice."